The Nail Junkie: SWATCHFEST: Layering, holiday mani, Red Dog Designs!!! 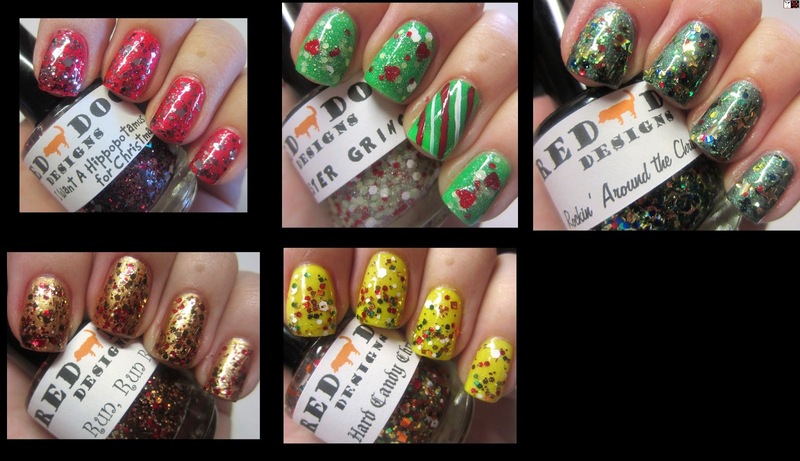 SWATCHFEST: Layering, holiday mani, Red Dog Designs!!! I couldn't wait to try out the polishes that Gina sent me for Christmas. So I put together several layering combos to show you. Then I added a single coat of "I Want A Hippopotamus for Christmas"
I then added two coats of "Rockin' Around the Christmas Tree"
I then added two coats of "Run, Run Rudolph"
My polish store is currently on vacation for the holidays, but will be returning after the first of the year. Stay tuned my blog, FB, and BRAND NEW Etsy store for details on my next re-stock. So what do you think of these vibrant holiday combos? Which on is your favorite? I just have to mention, I had so much fun creating this post. The painting, the photography...I love these polishes! Oh wow!! They all look soo good!!!!! And I am so going to steal your Mister Grinch layering idea!!! All of these are perfect together!! Loving all of them!